The Webster University’s 2018 softball team was recognized by the National Fast Pitch Coaches Association (NFCA) and received the 2017-18 Easton NCAA Division III All-Academic Team Award. This is the sixth consecutive season the team has received the Easton/NFCA Academic Award. Six players from the 2018 roster were also recognized as NFCA All-America Scholar Athletes. Webster University had 27 student-athletes named to the 2018 St. Louis Intercollegiate Athletic Conference Spring All-Academic Team, with representation from the women's tennis and softball teams, the baseball team, the golf team and the men's and women's track teams. Including the fall and winter seasons, Webster had a total of 62 SLIAC All-Academic Team selections in the 2017-18 academic year. Webster University students have been recognized as NCAA Division III national statistical champions in several categories on the baseball and softball fields. A week after graduating softball player Karissa Cardenas was declared the "Toughest to Strike Out" in 2017, baseball players Josh Fleming (lowest ERA) and Kyle Uhrich (strikeouts per nine innings) were also recognized for their champion performances. The baseball team itself was also NCAA D-III's top performer in strikeouts per nine innings. 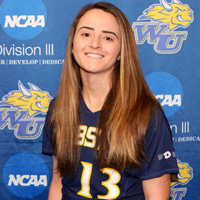 Webster University senior student and softball team member Karissa Cardenas has been selected to attend the NCAA Career In Sports Forum. This is the eighth year the NCAA has invited student-athletes with an interest in working in the sports industry to attend the forum. Cardenas will be the lone representative from St. Louis Intercollegiate Athletic Conference schools.